Peonies are a clump forming herbaceous perennial. Once established Peonies look fantastic, the flowers are showy and eye catching. Peonies need attention and can be quite fussy, and so have attracted the amber wheel barrow indicating medium effort and maintenance. They are not fool-proof, usually they do come up reliably every year but they can be tricky. Peonies require a sunny site, good humus rich well draining soil on the Alkaline side. That said, my soil is acidic and I can grow Peonies perhaps I am just lucky as they can be temperamental about soil. When planting a Peony do not plant too deep, the crown should be around 5cms (2") below soil level so quite shallow. If you mulch in the spring take care not to mulch over the crown. If your Peony is struggling you can try a balanced feed in the spring. The pattern of our weather the last few years has often produced a dry spring, in which case water the Peony to encourage the flowering. The main maintenance requirement is to stake the plant every year when the new growth starts in the spring. Also at the end of the season, the foliage can look unsightly and it is best to cut it down. As a herbaceous perennial Peonies die right back to bare earth in the winter; the emerging spring growth is attractive, see image below right. Peonies are spectacular; they have saucer like large showy flowers commonly red, pink, white with a few yellow varieties. 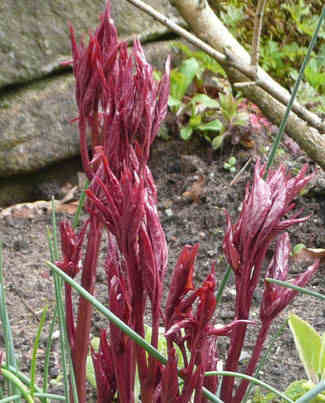 Peonies need staking/support before they get too tall and well before any signs of flower. This is a task I often leave until a bit too late, as a result it is then a nerve racking job of trying to thread leaves and flower stalks into the plant support without breaking anything. Peonies only flower the once so if a flower head is snapped, it will not flower. When growing Peonies it's much better to stake early and let the plant grow into the support. In the image left the support had been put in place a little late as usual, and so had to be eased over the foliage. Ideally it should be supported as the new growth emerges and before too many leaves are formed, image right. Peonies are medium difficulty to grow, mainly because they do need to be staked to support the flower heads. They also need ideally to be planted in the right place to start with as moving a Peony can be tricky. It is said that Peonies do not like to be moved and so best to plant them only the once. If necessity means you do need to move a clump of Peonies, there is no predicting whether they will tolerate being moved. The best way to move a Peony is early in the season before the plant has developed too much leaf, and quickly, and with plenty of existing soil attached to the roots to cause as little disturbance as possible. Dig up the plant and keeping it as intact as possible and transfer straight away, plant at soil level and water well, cross fingers. Peonies flower mainly in spring/early summer, and should be planted in full sun/mainly sun. They can be tricky to establish but once settled they are trouble free apart from the need for support. When selecting a plant picking those which have the RHS garden merit award is always a good guide which includes the image above show the lovely showy red flower of a Peony officinalis 'Rubra Plena' ; also with the RHS award are 'Bowl of Beauty' lovely delicate pink with dense centre of creamy white; P. 'Duchesse de Nemours' which has large fragrant white flowers; P. 'Sarah Bernhardt' lovely double rose like pink flowers which scented; and 'White wings' also scented as as you image white a single flower with yellow boss. Peony flowers come in four shapes: single flower head which has large central boss; semi double which is similar to a single but with more petals; double which has more petals, often ruffled filling the centre and with no discernible boss; and the anemone form which has single or semi double flowers with the centre filled with petaloids, such as in the 'Bowl of Beauty' which makes it very attractive.